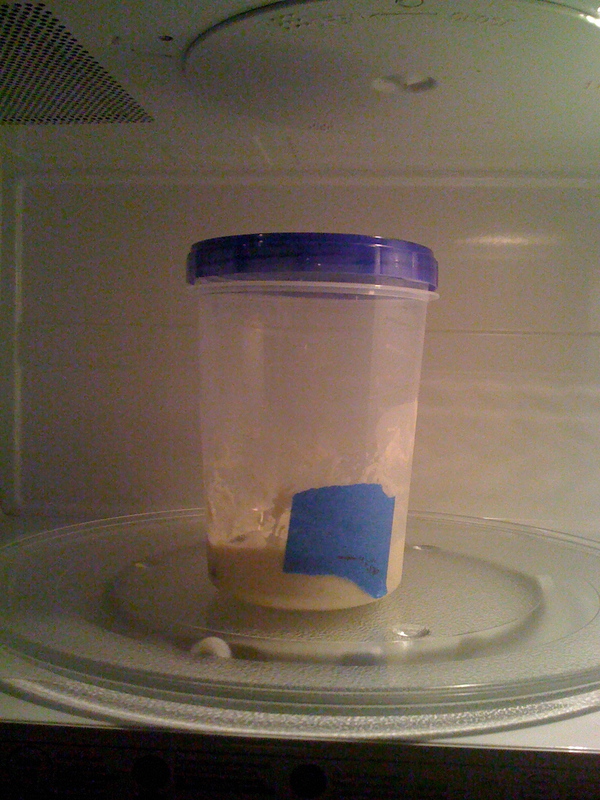 Thursday, 6:01 a.m. No signs of life in Baby Dough. Sad. So sad. What did I do? Where did I go wrong? Tuesday morning Baby was full of life! Thick and gooey! Bubbly and giggly! Now … now it’s just some mass of water-soaked flour in a 1-quart container. But, there’s no odor of death in there. It doesn’t smell toxic. Baby didn’t turn bad on me. There might not be a breathing and burping going on, but I don’t think there’s any rank, poisonous build-up taking place either. So, I’m keeping Baby and attempting to do a Frankenstein-like operation here. I’m adding more grapes. Yeast – Baby has no more yeast (a good thing for a real child, but as a dough baby, it’s the stuff of life). Thinking back to Tuesday, Baby started going downhill once I removed the grapes. So, I’m adding them back in. Fingers crossed. I saw a good idea from a YouTube video yesterday. Henrietta Homemaker put her grapes in cheesecloth for easy removal of the grapes. Brilliant idea. In those little grapes went, cheesecloth and all. It’s like Baby Dough has a diaper now. So, Baby Dough is back in the microwave, tucked in there with some warm water. I’ll check on him tonight. Perk up, Baby. You are currently browsing entries tagged with rye at The Dainty Dot.